Book your unforgettable experience now! Durgy performed for our daughter’s 1st birthday this past weekend. We really wanted a performer to keep our guests (mostly adults and some young children) entertained. Our friends and family were amazed and shocked by his tricks. Durgy did an amazing job getting everyone’s attention and keeping them engaged. Durgy is also very funny and easily got everyone smiling and laughing from ear to ear. We all had amazing things to say afterwards about him and his performance. Thank you Durgy so much for being a part of our daughter’s first birthday and making this something we will not forget! If you are looking for a very talented & energetic magician, this is your guy!!! HIGHLY RECOMMEND!! After seeing Durgy perform a few illusions at the dealership, I asked him to perform for a group of our Lexus guest’s for an upcoming event. I am so glad that I did! It made the night!! The feedback from our guest’s was stellar and the illusionist was the perfect finale! We recently had Durgy entertain a group of our Lexus guests at a resort in northern Ontario. Besides the fact that Durgy is an incredible entertainer, with the ability to blend in just the “right” amount of comedy, his magic truly leaves you asking “what the…”!! Our guest’s all gave five star feedback, and kept him performing well past the end of the show. It’s fun to watch someone who truly loves doing his job, and this is evident when Durgy performs. I look forward to seeing more illusions, but one word of caution, don’t let him hand you any fruit at the start of the show!! We had Durgy do one of our pre-wedding events where he performed acts in front of small groups and then a final act in front of the entire audience. Not only did he have a great act but had the charisma to pump up the entire crowd. Everyone said he stole the show and so many guests were inquiring about him after. I would definitely have him at any other function that we would do in the future. We had such a great time last year with Durgy, that we had to invite him back for our Christmas party. He didn’t disappoint. He was so much more than expected that we’re looking to create other events just so we can call him. Durgy, thanks for the show. The staff are still talking about it. The magic, spontaneity and entertainment of your show was fantastic. Durgy recently performed for our small corporate event at a Toronto art gallery. Our group had a great time and really enjoyed their time with Durgy, its was truly magical. I’m not even going to apologize for the pun. He made our group feel relaxed, as he wowed them. His performance gave our event the extra element of uniqueness to make our evening more memorable and special, as he interacted with our group. Durgy put great thought into his performance to focus on our small group and demographic. I also need to mention that he looked so elegant, relaxed and at home in the gallery during his performance as he mingled with our group. A true professional. Durgy made my wife’s 30th birthday. He truly went above and beyond and was not only a brilliant magician but a great guy to speak with as well. We were at a very loud restaurant with 35 of our friends but he was able to make the rounds, be heard (over music and everyone yelling), and blow the minds of everyone there. I would absolutely hire Durgy again for anything from a house party to a corporate event. The level of professionalism was great and he was on-point the entire time even though it must have been exhausting. I was initially worried about my party not being fun, but everyone by the end of the party was just talking about the different tricks he performed. I would recommend him and would certainly call him back in the future. We hired Durgy for our wedding reception in September 2015. He was very easy to communicate with, prompt, and professional with his presentation. Given our wedding was small, Durgy managed to involve a lot of our guests in his tricks, so everyone was happy. Looking forward to the next booking! Durgy was an absolutely amazing addition to our wedding reception. He kept all the guests entertained during cocktail hour and then put on an amazing live performance. I have guests still telling me days after how much they enjoyed Durgy and telling me all about the specific tricks he did for them. Durgy was also so easy to communicate with having him be one of the vendors for the night that I had no worries about. I cannot wait to see Durgy perform again in the future!! I found Durgy on kijiji and he was recommended by a friend also. I emailed him about my sisters 30th birthday. He called me right away and explained everything very clearly. When he arrived for my sisters party, he was on time and nicely dressed. His act was funny, very upbeat and a crowd pleaser!! It gave the party exactly what it needed! Fun entertainment so everyone had alot to talk about when he left. I would highly recommend Durgy for any type of event!! I contacted Durgy to have him perform at a wedding reception. He mingled in the crowd during the cocktail hour and simply mistified my guests. His tricks were captivating and he was definately a crowd favourite! If you are looking for someone to get your crowd in a good mood I would definately call him!! The best thing about his performance was it was catered to all ages! I recieved more calls about the magic performance than anything else. He was great to work with and got back to me in a timely manner! Thank you for a job well done Durgy Spade!! My wife recently surprised me with “The Magic of Durgy Spade” at my recent birthday bash! I would totally recommend Durgy to anyone looking to host an evening that will make your family, friends and guests talking about your party! Can’t wait to have Durgy at our next corporate event! I had Durgy at my sister’s wedding as a surprise for the groom. He did an awesome job entertaining everyone at the cocktail hour. Everyone was still talking about him after the wedding, amazed at the performance. He knew how to work the crowd and everyone loved it. There was always a crowd gathering around where he was to watch the tricks. Durgy was a pleasure to deal with, very accommodating, professional and punctual. I would recommend him for any event, you won’t be disappointed!!!!!! We recently had Durgy come out to a family wedding and we were not disappointed!! As people were entering the venue and hanging out in the lobby and their seats, Drugy was walking around and introducing himself to groups of people. He would catch people by surprise and on many occasions I would see the shocked faces after he had performed a trick. He is very professional and friendly with all the guests and organizers. I heard many positive comments from all our guests ranging in age from 5 to 80! A week after his performance, I have had people call to ask me about his contact information, thus, leaving a positive impression with the guests. I’m still trying to wrap my head around the broken fork!! I would definitely recommend Durgy to anyone and everyone! Durgy was an excellent addition at our National Conference, performing for over 150 of our guests. He was the perfect addition to our event and left our delegates truly amazed! It was a pleasure having Durgy at our event. He was extremely professional and easy to work with both before and after the event. I would recommend him to anyone for corporate or private events. I had Durgy perform at a family function for the past two years and couldn’t have been any happier with him. He is a true professional and knows how to work crowds of all ages! It’s such a relief to have someone perform for your event and not have to worry about having interest from the crowd. He gets people involved and manages to win over even the “tough ones” which are typically skeptical and don’t get involved. 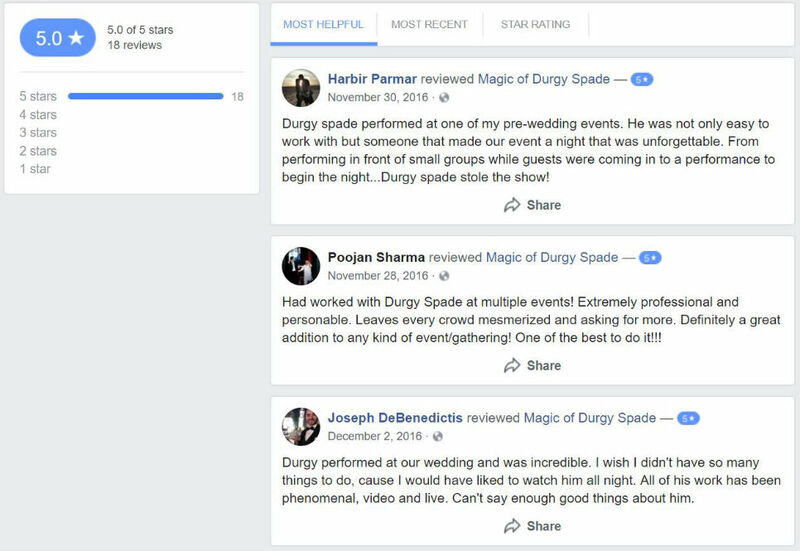 I can confidently recommend Durgy for anyones event and know they’ll be 100% satisfied! Thanks again Durgy, you’re always a pleasure to have perform! 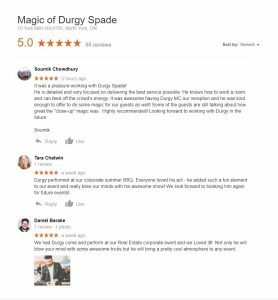 Everyone was still talking about Durgy’s performance a couple of weeks after we hired him for a corporate event! His tricks were awesome and really wowed the crowd. He is great to work with, amicable and reliable (he even performed with a dislocated shoulder!). We definitely wouldn’t hesitate to hire him again. I booked Durgy for cocktail hour during my sister’s wedding reception that took place in June 2015 and he did not disappoint! I spoke to several guests who had the pleasure to watch him perform that night and all were very impressed. Words such as “mind-blowing” and “amazing” were used to describe his acts. Durgy was very professional and a class act from the get-go. He responded to all my inquiries in a timely fashion, was punctual, and made sure I was comfortable with everything along the way. Durgy interacted with the crowd brilliantly and it was evident that he’s passionate about what he does. For anyone considering to hire him, all I can say is “Do it! !” Watch his videos on youtube to get an idea of his brilliant magic. I’ll certainly be recommending Mr. Durgy Spade to others and hopefully will get a chance to call him again for a future event. Durgy was great to work with. I hired him for my wedding reception and he was great at entertaining the crowd during the cocktail period and his main stage act. He is very energetic and was successful in captivating the crowd by getting them involved and making them see the impossible. I would recommend Durgy for any event. Amazing performer and goes out of his way to make sure everyone is having a good time! Heard nothing but good things about him at the SMILE gala! Thank you for a wonderful performance and going that extra mile. My guests were impressed and left speechless, you made my 50th birthday party a hit! We hired Durgy Spade for our corporate holiday party. From the moment we met him we knew we had chosen one of the best magicians in the GTA. He “wowed” his audience with his creative and shocking tricks. We wouldn’t hesitate to hire him again. Durgy, it was a pleasure having you over at my place to perform for my family. We’re still taking about your tricks man. You have a great sense of humor, and it goes without saying you are very talented. I would not hesitate to recommend you to any of my friends and family. Still don’t get how you guessed my brother’s card man. Crazy!!! Thank you for making the Engagement Party just that much more entertaining! You were very engaging with the audience and professional. Everyone seemed to comment about how amazing you were at the end of the event. Thank you again for a great time! Thank you for making my wedding day special. Your performances were remarkable. [Undisclosed] and her family couldn’t stop talking about your performance, they absolutely loved you! My husband and I were saying we should have had out videographer on site during that time! Thank you for coming out! Everyone loved it! You’re damn good at what you do… Soo glad you were able to make it! We recently celebrated our business’ 10 Year Anniversary. We knew we needed to create a buzz and give everybody something to talk about. After seeing Durgy on TV I immediately reached out to him. He was very quick to respond and very professional. He showed up to our party and stole the show. A month later, I am still getting messages from people in attendance who loved Durgys performance, it was definitely one of the highlights of the night. I would HIGHLY recommend Durgy for an event of this nature (or any for that matter), and look forward to bringing him out again. Amazing stuff! I am writing just to thank you for a great job during our event. All our guests liked your performance and everything went well as we planned for the whole evening. Thank you very much for coming over and making the event a grand success. We hired Durgy for our company Holiday Party this past year and could not have been more pleased! His work/performance is nothing less than spectacular, he blew our guests away! He started with mingle illusions, followed by a half hour illusion/magic show, then closed the evening with more table/mingle illusions! Durgy, is truly talented and left our guests talking for days on end after the party! Not only is he super friendly, down to earth but truly a talent! We are still in aw with some of the illusions that Durgy did, it really is “magic”! We look forward to hiring him again for future functions. That was awesome!!!!! Durgy – thanks for coming on! A magical morning on Global Winnipeg. Thanks for freaking us out! Thank you very much for yesterday, it was very entertaining and you were amazing! Thank you so much for such a great show. Everyone loved it — and we’re still blown away by the newspaper!!! Not to mention the $5 trick!!! Super fun. The party was a great success, and your presence added to all the fun. Durgy is a class act. Hire this guy and you won’t be disappointed. He’s not just a magician, he’s an entertainer. I recently had the privilege of watching Durgy perform at a private event and I can say that he is a wonderful performer and very entertaining. We intend on inviting him to our event again and I look forward to seeing his other tricks. Thanks! His magic really is mystifying and electric! He is very engaging and personal whenever he is performing. His craft is only getting better over the 10 years as he has been mystified me. The sky is the limit with his expertise in magic. You will be amazed and will be wearing the “Oh-face” throughout his performance, guaranteed! Electrified the crowd and great to work with. My guests had lots of fun with his street magic during the cocktail hour! Hey!! You did such a great job and everyone is still shocked as to how all the tricks happened as am I! Amazing!! Thank you Durgy for being part of the most memorable day of my life! Thank you for the show that you put up. It was very entertaining and the audience was very involved with your act which is very important for any performer. We will certainly invite you again to our future events. Thank you to Durgy Spade for adding a touch of magic to our engagement party. You truly blew the minds of all our guests!!! Durgy, you absolutely killed Saturday night. Thank you! The magic of Durgy Spade is something that everyone should experience. Durgy’s ability to please crowds of different sizes with his repertoire of illusions is necessary if you’re looking to take your event to the next level. Hey Durgy- you were terrific yesterday. Thank you so much for being a part of the most successful fashion show we have ever done. I always wanted to propose to my now fiance in a magical way and Durgy was my ticket to bringing my ideas to life. His patience, level of professionalism and true willingness to go that extra mile for my special event really showed me the passion he has for his work. He made a lasting impression on myself and fiance and showed great charisma, poise and style while performing for us the night of. I could not have imagined a more perfect night to my new beginning. We had the pleasure of working with Durgy during a corporate event that we hosted. From the moment he commenced his act,it was obvious he was an instant hit. He performed a trick on stage in front of a large audience and continued performing tricks throughout the night within small groups. His style is unique and his charming personality positively contributes to his performance! Durgy was the highlight of our night/event and the lasting impression he left on our guests will definately be remembered for a long time to come. We’re looking forward to working with him again! Durgy you made my special night amazing. I am still getting calls about your amazing performance left, right and centre! Spade combines unmatchable skills and charisma to deliver one hell of a magical performance. I’ve seen a few magicians in my time, Durgy transcends mere illusions and slight of hand. Durgy is incredible, everyone asked where we got him from, and people continued talking about his illusions well after the wedding was done. He is definitely, a must for any wedding, party, birthday, bar, anything. How the **** did he do that?! Durgy put on a fantastic show for my brother’s big 30th birthday party! What was especially great about this show was that I’ve seen him perform his magic before, but every time it’s a new experience! I was amazed by his magic, as if it was the first time I had seen it! The crowd was loving it and it made the highlight to a great birthday party! Looking forward to more shows performed by Durgy! It’s Nadia from the birthday last night. As I was telling you yesterday, I thought your show was awesome! I’ve been to a couple magic shows in Vegas and I totally found your show to be more entertaining. I actually fell asleep during the show in Vegas! Those shows were more about the antics and props, while your show was about the actual magic. Your show was amazing, and I’ll definitely be telling people about it! Thanks Durgy for performing and bringing some magic to our event. We were all in awe each time you did another trick because I think we were trying to figure out just HOW you were capable of doing some of those mind blowing illusions. Thanks again and we are looking forward to having you again! Thank you for a captivating performance. It was easily the best and most unique act of the whole night! Durgy recently performed at a team conference and was a huge success! He was easily able to entertain and WOW the crowd with his entertaining and mind boggling illusions. He was so good in fact, that we had him stay and perform longer that night. We found Durgy easy to work with and very accommodating. We would highly recommend having him! Durgy was very pleasant and easy to work with. He accommodated to our schedule and also arrived promptly at the time we discussed. The guests really enjoyed seeing his magic and were left amazed at some of the tricks that were done. I would definitely recommend having Durgy at one of your events, and we also look forward to having him entertain our community again in the future. Durgy was very charismatic and incredibly entertaining. This is a man who knows how to capture his audience and keep them wanting more! We have hired Durgy in the past for personal and client events, and have nothing but good things to say. He is very engaging with the crowd and always leaves them wanting more. He is creative, charming and extremely passionate about his work. We would recommend Durgy without a doubt for your next big event. I wanted my guests to feel engaged and they certainly were wowed! His performances kept conversation going and all my guests truly enjoyed celebrating with me. My friends were tweeting about it the next morning and another friend even booked him for an event that same weekend. This is the kind of impression Durgy will leave on your guests!